Simple mic technique can fix your podcast from sounding cheap and amateur to far more professional. 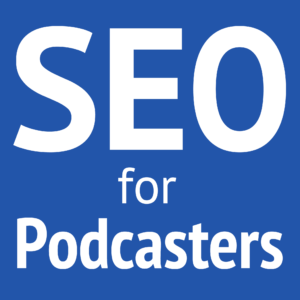 Apply these five simple tricks to sound better podcasting! A big mistake early podcasters make is talking too far away from their microphones. This makes the audio more susceptible to room noise, reverb, and harsh tones. Get closer to your mic and turn down your gain (the sensitivity of the mic). This even works with internal mics, when you combine with other techniques. On the flip side, getting too close to your mic can be bad, too. This will pick up excessive breathing, mouth noises, and pops from letters like P and T (call plosives). Depending on your mic, the optimal distance is about four fingers' width away. Pointing the mic directly at your face causes the most plosives as the puffs of air some letters make will go straight from your mouth. Pivot the mic around your mouth so you are talking past the mic instead of into the mic. 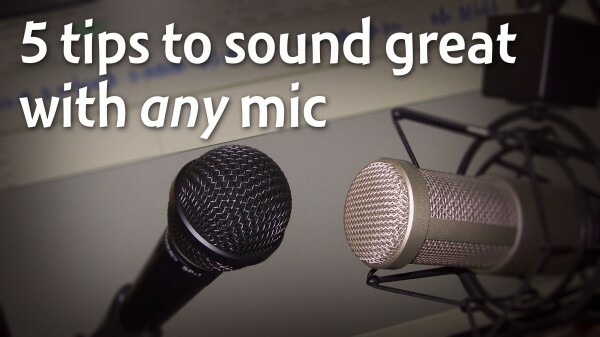 Unless you have a noiseless overheard boom arm LINK and shock mount, never ever touch your microphone, stand, or anything touching the mic or stand while you're recording. The creates loud booms in the recording. What you do away from the mic is just as important as in front of the mic. Avoid loud keyboards, squeaking chairs, cracking knuckles, whispered conversations, background noise-makers, and more. I’m speaking in the Podcasting 101 track at BlogWorld NYC! Please join me at BlogWorld in New York City on June 5–7. I’ll be one of the panelists in the Podcasting 101 track and presenting on the last day of the conference. Register for BlogWorld NYC and use promo code “PodLewis10″ to save 10% off your admission! 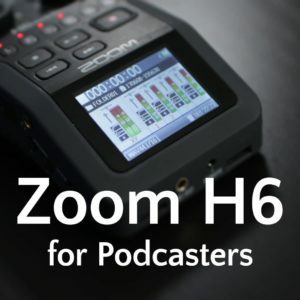 For the month of May, I'm blogging a daily photo with tools, tips, or cool things related to podcasting. Subscribe to the blog via RSS or email so you won't miss this fun series! My co-host occasionally forgets to get close to the microphone despite hearing himself through headphones. I can hear the difference so I’m frequently directing my co-host and other guests to get back in there and talk into it. Note: eating is a noise you can try to hide from the mic by being far away but the best solution is to eat before and or after the show. 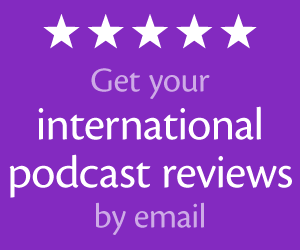 I struggle with this on my other podcasts, too. The others aren’t as comfortable with a mic or as conscious of their positions. Eating sounds nasty through a recording! Drinking soda (not recommended for voice) can also be noisy. The mic stand works well for someone seated as I can swing it down from the side of my desk. Rule #4 can be expanded to “No Table Tapping.” That’s the rule we have at Theatre Geeks podcast. There are generally three (sometimes more) of us around a table we’ve padded with a thick cloth, but tapping on the mike stand does happen as well. (We don’t use the fancy mike arms.) Good tips about mikes here. I just had someone recommend to me a Blue Encore mike that runs around $150. It’s a dynamic mike, but it uses phantom power to run a built-in pre-amp so you can run at lower gains on your mixer. Nice because some lower-end mixers will inject hiss into the recording when you have to turn up the gain. I’m thinking of giving one a test. PS: did you post the video of this episode? Yes! That’s a great rule. Unfortunately, the video recording didn’t work right and wasn’t the quality I had expected. Thanks for the tips on event coverage, Derrick! For the past few years I have volunteered to run the photo team for our church’s Arts Camp. We need group photos of each class as well as candids and, in order to ensure that each class is covered more than once during the 5-day camp, I have to coordinate and schedule multiple photographers (myself and 2-3 others). I’ve done many of the things you suggested, but also appreciated learning from your experience. I got a noiseless overhead boom thing and shock mount for Christmas!!!! Great! I’m sure you’ll love them. Is the mic in this link any good? And is this stand any good? I mean in making videos on gaming? If the video is of you, then you should consider something that doesn’t hog space in the camera. like a Røde headset (not a cheap, standard, USB headset). Otherwise, if the camera won’t be on you, then this mic works good for any audio. I recently listened to the episode and I enjoyed it. My brother and I co-host a podcast together. We currently use the internal mic on our computer, so we really need to upgrade. We don’t want to spend a lot on a mic, but is it better to get 2 cheap microphones or one better one that we could share? You will almost always get better quality if you each have your own microphones. Otherwise, trying to be close to the mic (4–6 inches) together can be awkward and uncomfortable. Right now, the Samson Q2U is the best, cheap USB microphone at about $50. But I recommend the ATR2100-USB more highly when it’s below $50.